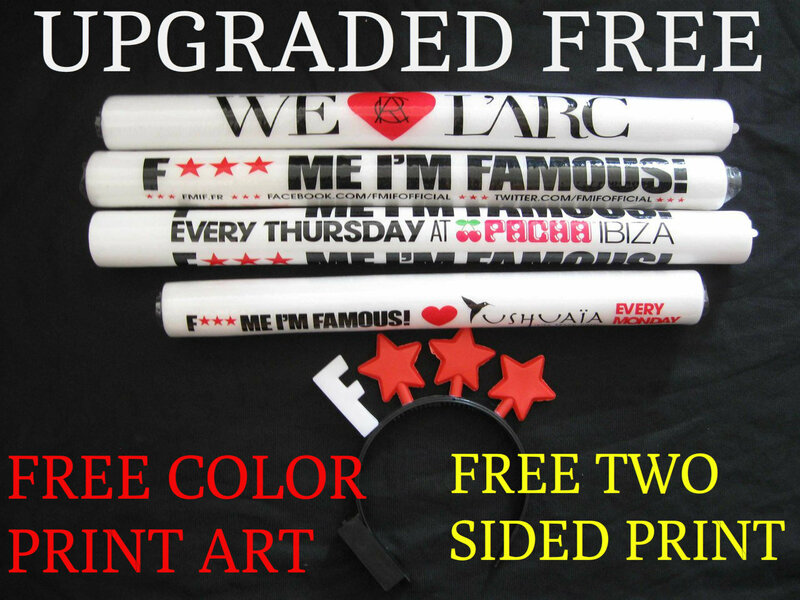 18" CUSTOMIZED FOAM STICKS - 3 FUNCTION L.E.D. Used in all the mega clubs in all the large cities, 18″ inch LED Lite Sticks will get you and your friends together to have a great night. With its multi function lighting, you’ll be able to control the vibe of the room. Get your party on with the strobe or set a calming mood with the morphing colors of red, green, and blue. Great not only for the club scene but for social activities like concerts and sporting events. Being 18” long and 1.5” wide, the LED Lite Sticks are the ultimate handheld party tools. Our customization is done with a vinyl label. Printed full color one or two sided. Our ink is latex ink so it does not rub off the label nor does it rub off on your clothes when sweating or when wet from holding drinks. Our label is 8.5″ x 6″ inches wraparound and we are happy to make the art for you or you can make the art yourself. 1 or 2 sided. FREE COLOR PRINTING UPGRADE! Special Promotion! 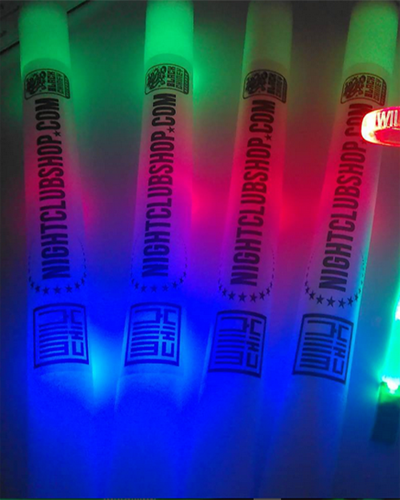 SEE OUR BULK PRICING ON REGULAR ITEMS AND SEE YOUR SAVINGS WITH NIGHTCLUBSHOP! Get your party going and your crowd hype with the strobe function or set a calming mood with the morphing colors of red, green, and blue. 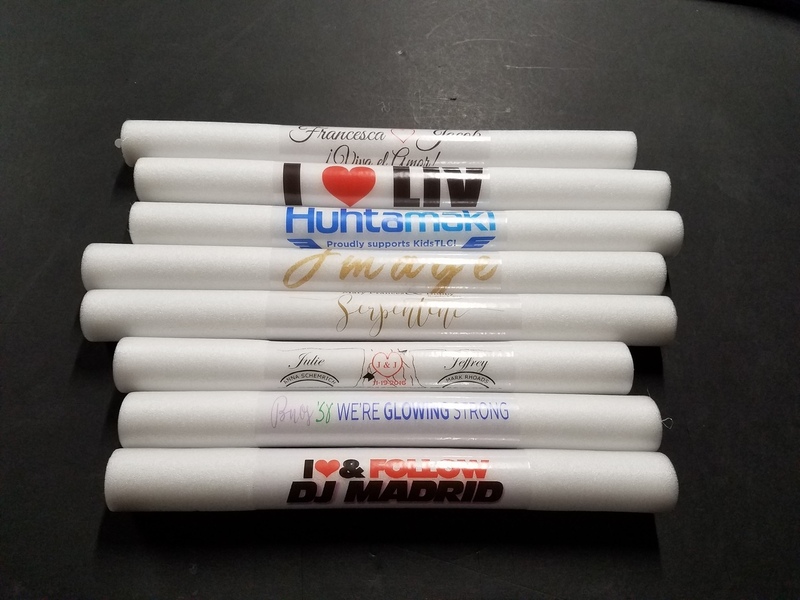 These Foam Sticks are used in all the mega clubs in all the large cities all over the world, these are the 18" inch LED FOAM STICKS. With its multifunction lighting, you’ll be able to control the vibe of the room and crowds love to pump these in the air when their favorite music is playing. Great not only for the club scene, but for social activities like concerts and sporting events as well as for Halloween and New Years. These "LED FOAM STICKS" are 18” long and 1.5” wide, the "LED FOAM STICKS" are the ultimate hand held party tools and great for giveaways or income generators. These custom foamsticks will spread your message in an intriguing and unique way. Catch the eyes of everyone at your event and bring life to the party. If you're looking for new ways to make your audience engage more then there is no better product than these custom LED foamsticks. AREA TO USE IS 10.5 x 6 INCHES. CUSTOMIZE YOUR FOAM STICKS FOR ANY PARTY. AREA TO USE IS 10.5 x 6 INCHES WRAP AROUND. UPLOAD YOUR FILE USING OUR HANDY UPLOAD TOOL NEXT TO THE PRODUCT PICTURE. CLICK ON HOW MANY YOU WOULD LIKE TO CUSTOMIZE. CUSTOMIZING HAS NEVER BEEN EASIER. WE WILL EMAIL YOU A PROOF WITHIN 48-72 HOURS. We Carry several different kinds of "Foam" LED Light/Glow Sticks as well as Traditional Liquid Filled "GLOW" Sticks. *We have the Higher Quality, Higher Grade 16" (inch) "7 Function" L.E.D. Foam Sticks. These obviously have better L.E.D. interior parts and better lighting as well as they are the most durable and re-usable. *We also carry the lower end 18"(inch) "3 Function" L.E.D. Foam Sticks. These are a bit less in quality but a great "Bang for your Buck"
Are available for Customization and can be wrapped with your Color Logo or ArtWork. Call 813-720-0409 after purchase for Customization Details and Proofs. 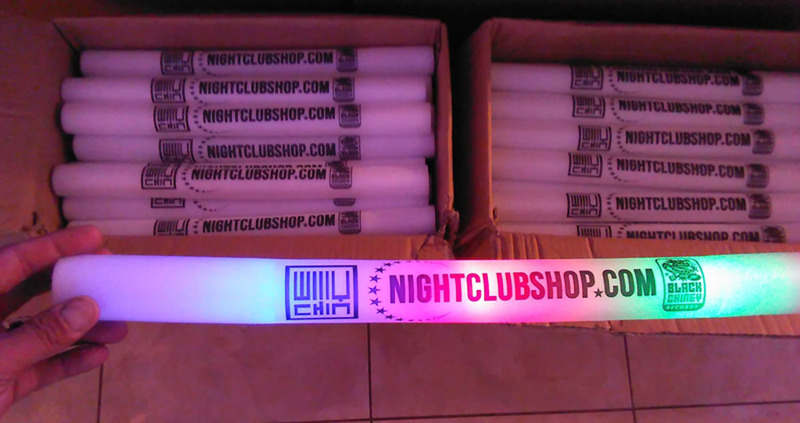 The NIGHTCLUBSHOP.COM Custom Printed LED FOAM STICKS and CUSTOM PARTY WEDDING GLASSES are products done in-house by our friendly and devoted staff and work associates. We custom design and quality inspect every one of our products, all custom orders are produced and inspected by hand to insure the best quality Custom Work in the industry. Custom Printed Wedding LED FOAM STICKS - With your Text, Logo, or Art. PLEASE READ BEFORE ORDERING, Our PRINTING METHOD has been Changed for BETTER! WE HAVE CHANGED OUR PRINTING PROCESS TO "GREYSCALE BLACK" Print instead of 100% BLACK PRINT on the CUSTOM PRINTED LABELS AND LED FOAM STICK CUSTOMIZATION. The moisture on peoples hands make the 100% BLACK PRINT Bleed and smear. Sometimes the ink even got on Clients fingertips and on their clothes. The reason that was happening was because the 100% BLACK INK was too thick on the Custom Area and labels and would always give problems. We have found a way to CORRECT that problem by printing the LED FOAM STICK Custom AREA in Dark GREY SCALE instead of 100% BLACK. 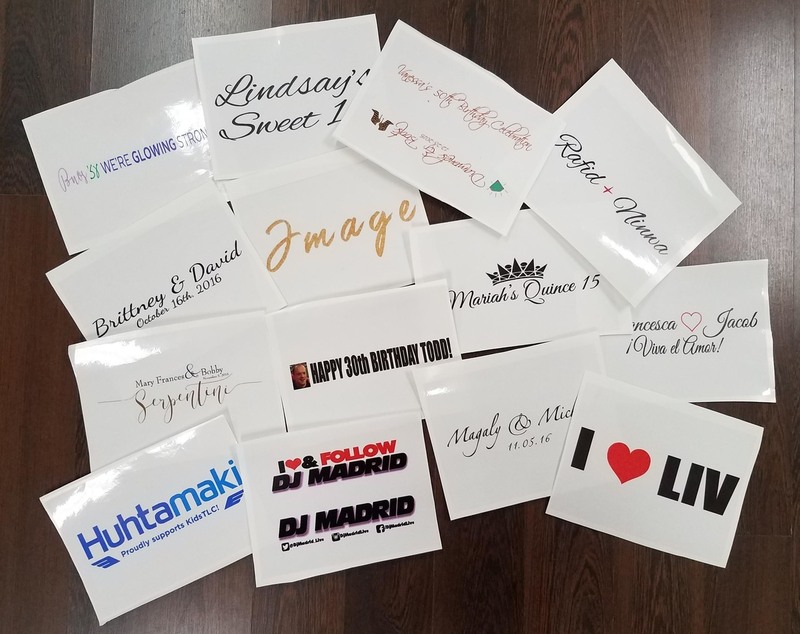 in GREY SCALE BLACK PRINT the ink will not smear, or Bleed onto the users fingers or hands and has proved to be a much better way to Personalize these Custom Party, Custom Event, and Custom Wedding LED Products with your name or ARt. The Custom Printed BLACK GREY SCALE printing method is actually better for LOGO's and ART because it lets us get a more detailed, higher resolution image with better fine print and detail. it is simple, just call 813-720-0409 prior to placing your order. When it comes to creating a party atmosphere, few products like our LED foam sticks can get the crowd involved and make your party or event come alive. Our LED foam sticks are made with durable opaque foam that allows the LED lights to make the stick glow. An electronic switch at the bottom changes the function. Each foam stick is rated to last about 12 hours of constant use, batteries included. Our 18 inch foam sticks are able to be customized with your logo, hashtag, tagline or pretty much whatever you want, color and content. The most popular and economical of the different types of foam sticks, our 18 inch foam sticks offer 3 functions of RGB (Red, Blue & Green). 3rd function is a random cycle of all 3 colors. Our 18 inch foam stick is ideal for large crowds because it is economical and you get the most “bang for your buck”. Our 18 inch LED foam sticks are made differently than other 18 inch in that the RGB lights are distributed throughout creating a more even glow throughout the whole foam stick. Our LED foam sticks are sure to be a hit and get your party to that next level no matter what the age or occasion. Whether for a crowd of thousands or a small event, our 16 inch foam sticks will start and end the night with a hit! Nightclubshop.com is a online Verified Merchant and uses SSL Encryption on every order for your financial security and piece of mind. We ship mostly via FedEx and UPS with Tracking Numbers on your Account and order info.